No Nonsense Number Facts provides a coherent programme for supporting fluency in number facts. This is in line with the aims of both the National Curriculum and Teaching for Mastery. * The elements of the National Curriculum that focus on number facts are grouped around key understandings in each year, so that the content follows a clear progression. * Teaching activities are designed to run for 15-30 minutes. * Resources for use in the activities are provided. * Lesson organisation is clear but flexible, so it can be adapted to the needs of your pupils. 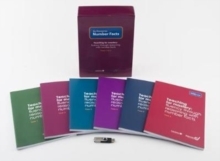 * The included USB stick contains editable files of all overviews, lessons plans and resources, as well as video guidance from the authors.